Travelling through Tamil Nadu is a fulfilling experience if you are a lover of nature, culture, heritage and history. Tamil Nadu is a state that flaunts its culture and stands proud with its majestic temples and rich heritage. Let's take a road trip to explore some of the beautiful places in Tamil Nadu as we travel from Chennai to Madurai covering Mahabalipuram, Pondicherry, Chidambaram, Thanjavur and Trichy. The route roughly covers 518 km. From Chennai, let's take the East Coast road to travel to Mahabalipuram. The distance from Chennai to Mahabalipuram is around 52.5 km. Before you start the trip, make sure you've visited all the major attractions of Chennai. Here'e a list to choose you favourite attractions in Chennai. It would take you around an hour to travel from Chennai to Mahabalipuram. Some of the places you could visit here are the Shore Temple and the Crocodile Bank. Pondicherry is not too far from Mahabalipuram. Taking the East Coast road, it takes around an hour to reach Pondicherry which is 50 km from Mahabalipuram. The Pondy Beach and Auroville are among the best attractions of Pondicherry. From Pondicherry, Chidambaram is around 63 km away and would take around one hour and 20 minutes by road via East Coast road. Here are a few attractions in Chidambaram that are not to be missed. It takes around two and a half hours to reach Thanjavur from Chidambaram. The major roads to be taken are NH227 and NH45C. After covering a distance of 110 km, you would be at Thanjavur that's known for its paintings and the Brihadeshwara Temple. Here are some other places that you could visit in Thanjavur. Trichy is a city that's developing at a fast pace and is also a popular industrial town in Tamil Nadu. Taking the Coimbatore-Nagapattinam highway, it takes around an hour to reach Trichy from Thanjavur. Here are the places to visit in Trichy. 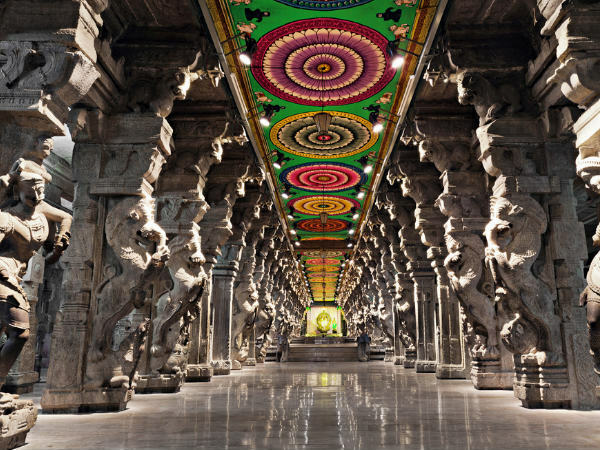 The Madurai Meenakshi Temple is one of the most visited attractions of Tamil Nadu. A road trip here wouldn't be complete without a visit to this temple. It takes around two hours by road from Trichy to Madurai via NH45B. Here are some more places you could visit during your trip. Please follow this link for a better idea about the route.